Its Karen on the blog today with my first Kennedy Grace Creations post for 2017. Today purple is my colour of choice. I used the gorgeous Beautiful Blooms - Sweet Rose stamp set to create my card. Its such a pretty stamp. 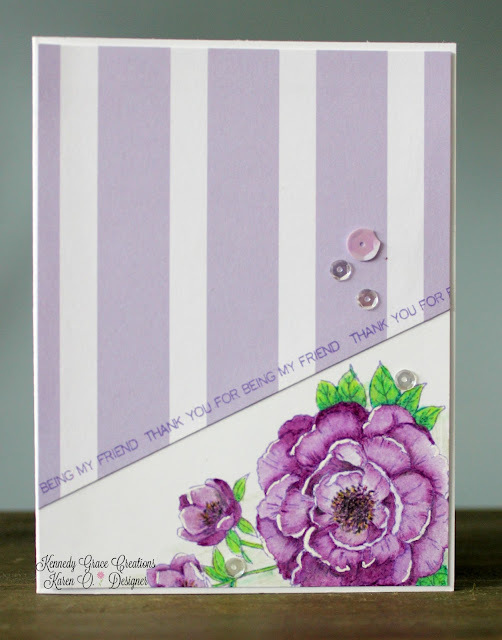 I stamped it in purple ink to soften the outline and to blend with my colouring. Its coloured using Derwent Coloursoft pencils. The sentiment comes from the same stamp set. Finished off with some pretty Lilac Garden sequins.